Stephanie McEwin, who is a Fine Arts Honours student at UC, is celebrating after winning first place and $2500 at the inaugural Christchurch Art Show for her piece Yellow Beach 1. 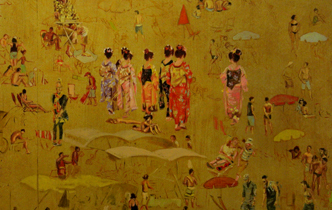 McEwin has described her creative painting as “kitschy” with a 1950s feel. Following this exciting accomplishment Stephanie has her sights set on travelling to India where she can learn more about heavily populated nations and develop the theme of her artwork. For further information read more here.